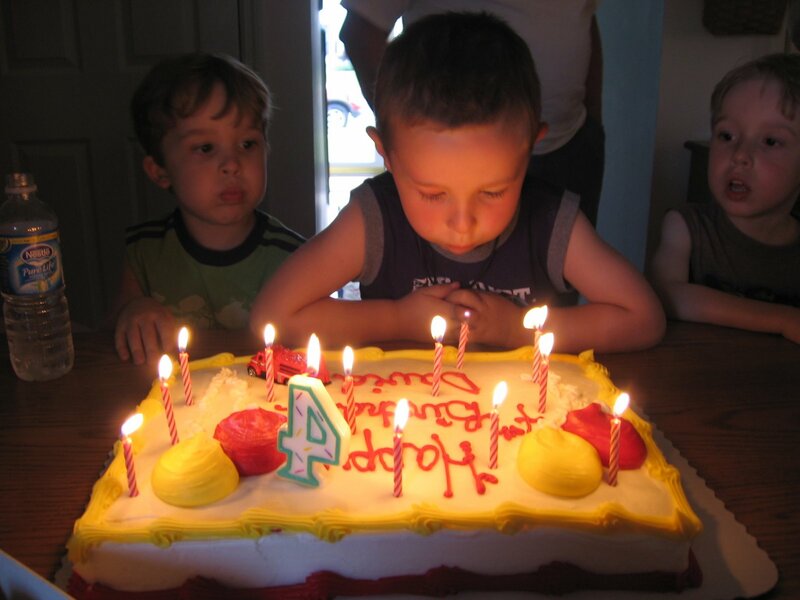 Well, we finally got around to having David’s 4th birthday party this past weekend, and had a great time. I had my new margarita machine turning out some tasty drinks, lots of food and fun. Minor incident from the day was the swing accident… Hubby was pushing David on the swing, and David fell off (in front of his cousin, also on the swing) and he ended up with a kick in the head from cousin’s shoe by accident. He didn’t even cry really, more sulking than anything, but by Sunday the skin around his eye was red, minor black and blue. This morning it looks much better, though. I’ve got a day of work ahead of me and a rip-roaring headache. And, tonight is a dinner that S. and I have to go to for his work. It’s an awards dinner for his company, and can I tell you DRY is the adjective to describe this event. Not looking forward to it really. Kind of like going to the Dentist. Lastly, I’ve got some other bizarre stuff going on that I’ll chat about later. For now, I really need to find some Tylenol! This Monday is shaping up to be a swell day. « Can you get it studded with diamonds?